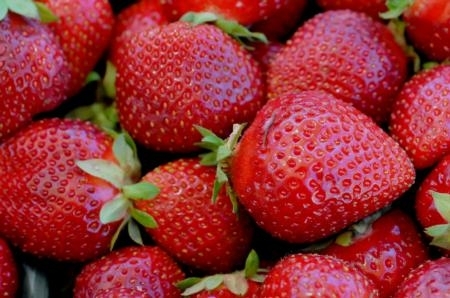 Join Ventura County strawberry growers at the 13th Annual Strawberry Production Meeting! Strawberries are the largest crop grown in Ventura County and represent millions in revenues to the area. UC Ventura County Cooperative Extension advisor Dr. Oleg Daugovish sponsors this event every year to update the public and county growers on the latest in strawberry research. The meeting will feature agricultural experts who will speak on topics relevant to strawberry production in Ventura County. Several presentations will focus on irrigation, an important issue for growers in drought-susceptible southern California. Event is free, no cost to public and includes lunch and refreshments. Contact Oleg Daugovish at 805-645-1454 or odaugovish@ucdavis.edu for registration or to make special arrangements. See here to view flyer/agenda for this event! Continuous education credits have been approved from the Department of Pesticide Regulation and VCAILG credits have been requested from the Regional Water Quality Control Board. 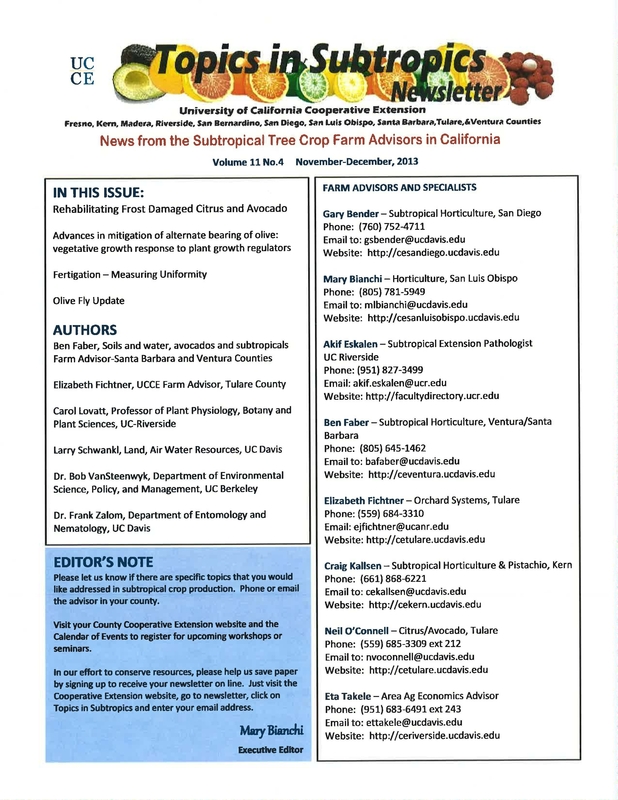 Check out the latest issues of "Topics in Subtropics," a newsletter produced seasonally by a group of UC Agriculture and Natural Resources subtropical tree crop farm advisors, including UC Ventura County Cooperative Extension's Dr. Ben Faber. These advisors contribute articles related to subtropical horticulture, citrus, avocado and other related areas. Rehabilitating Frost Damaged Citrus and Avocado - Although we live in sunny southern California the area has been subject to winter freezes. This article by UCCE Ventura advisor Dr. Ben Faber gives advice on ways to mitigate the damage caused by frost. Advances in mitigation of alternate bearing of olive: vegetative growth response to plant growth regulators - UCCE Tulare advisor Dr. Elizabeth Fichtner and UC Riverside professor Carol Lovatt contributed this article on the results of their studies on the relationship between fruit load and vegetative growth on 'Manzanillo' olives. Fertigation - Measuring Uniformity - Dr. Larry Schwankl, a UC Davis irrigation specialist, discusses steps to uniformly apply fertilizers. Fertigation is the injection of fertilizers through the irrigation system. Olive Fly Update - UC Davis professor, Dr. Frank Zalom and UC Berkeley professor Dr. Bob VanSteenwyk provides a article on olive fly monitoring and treatment. Read the full articles from this newsletter or check out other issues of Topics in Subtropics here. The Spanish Avocado Industry - Dr. Ben Faber, UCCE Ventura advisor, reports on the avocado production and issues in Spain which has similar amounts of acreage devoted to avocado as California. He discusses his observations on varieties, productions and diseases and pests that affect these trees. Strategizing for Water Cutbacks - Avocado and Citrus - Dr. Faber also contributed this article for saving water, important in these drought stricken times. California Agricultural Production Statistics - A short summary of statistics on the top California agricultural commodities for 2012 and other pertininent data including additional resources are presented here. Maintaining the Citrus Orchard with a Reduced Irrigation Allotment - UCCE Kern County advisor, Craig Kallsen, also contributed more information on reducing water usage and still maintain an orchard. The 2014 Drought in California - This article by UCCE Riverside County Director and advisor Etaferahu Takele summarizes some of the federal, state and UC resources for dealing with drought.